A grey day and it's our 50th wedding anniversary! Our bus left Queenstown at 8am and stopped for morning tea at Tullah. Once a silver-lead mining town, after closure in 1974 and in 1976 homes were constructed to house workers on local hydro-electric power schemes but it now appeared disserted and many shops vacant. Roseberry Lake, formed by a dam was a popular fishing location and offered amazing reflections in its dark tannin-stained water. On to Cradle Mountain, a World Heritage area which has Mt Ossa,Tasmania's highest mountain includes Lake St Clair Australia's deepest freshwater lake. 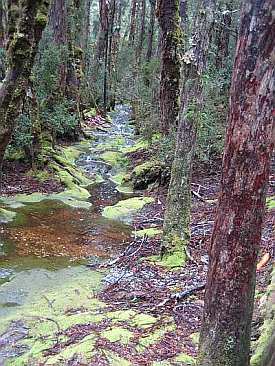 This, Tasmania's best-known national park covers more than 1260 square kilometres. We are met by a guide at Dove lake This 2 km long glacial lake has a 7.5 km very popular wilderness walk around the lake. A gentle drizzle descended... and we follow the walkway to the water's edge - sadly the mountain's grandeur is shrouded in mist. We are taken 5km by shuttle bus along the Dove Lake Road at the northern end of the Cradle Mountain, to the restored Waldheim Chalet which provides visitors with an insight into the early history of the Cradle Mountain area and we learnt about Gustav and Kate Weindorfer who built their rustic home and guest chalet in 1912, naming it Waldheim, meaning "forest home". They played a pivotal role in establishing the National Park. At Sheffield we stop to admire the murals on walls throughout the town before we reach our Hotel, "The Beachfront Voyager" at Burnie where a surf competition was in progress.